Fantastic series of goal on Children’s day! 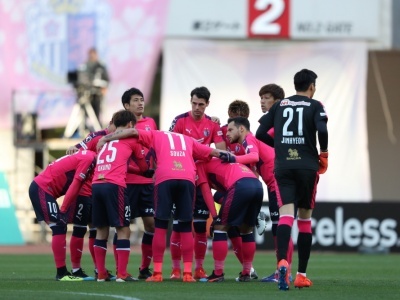 Cerezo grabs a victory at the last game after the consecutive 11 matches. Yoichi Kakitani, No 8 of the Cherry blossom squad scored an opening goal on the 30th minute. After intercepting from Yuhei Tokunaga, Kakitani received a return pass from Toshiyuki Takagi, dribbled through the left flank while fooling defenders by feinting one way then the other, and faced one on one with the Nagaski goalkeeper, but calmly shot the ball to the left side corner of the net. A smooth finish, “This is the Kakitani’s touch.” The stadium was filled with deafening joyful roars of fans. The next person who entertained the supporters was Yusuke Maruhashi. On the 37th minute, his shot from Kakitani’s free kick sharply curled toward the goal, and was sucked into the back of the net. In the moment, Maruhashi, himself, was surprised by the unexpected result, and all the Cerezo fans stood up for the celebration of his world class act. 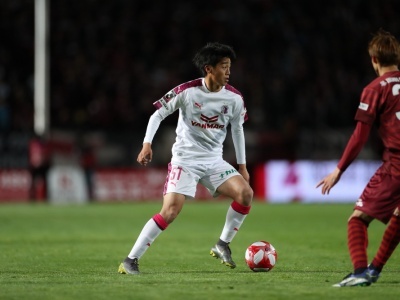 The last game against Nagoya Grampus was played with heavy rain at which Cerezo finished without a goal despite having 11 attempts, which frustrated both the team and the fans. In light of that, today’s 2 goals were brilliant which will sweep away all the negative feelings. In the second half, Cerezo created a chance faster than Nagasaki. On the 53rd minute, Kakitani moved to the right flank, and ran the channel to meet a sparkling cross from Riku Matsuda with his shot, but it went narrowly wide. One minute later, Nagasaki managed to score a goal. Afterwards, they continuously threatened Cerezo. On the 58th minute, with the hope of a game change, Nagasaki manager, Takuya Takagi, brought on Juanma who set up a goal, which turned Cerezo into a worse position. Cerezo survived the onslaught, patiently closing down the opponents’ attempts as shown by Matei JonJic ’s last-ditch save against Juanma’s shot, which was parried by the Croatian’s face. On the 72nd minute, Manager Yoon finally sent on Mizunuma and Yamamura for Kakitani and Fukumitsu, with the aim of reducing Nagasaki’s dominance, by changing the formation into 5-4-1. With his tactics, Cerezo put out a defensive side, while waiting for a chance for a counter attack. Yoon’s formation effectively blocked Nagasaki’s momentum and Cerezo scored the third goal, a wining goal, on the 86th minute. Yang Dong Hyun kicked the ball from Kim Jin Hyeon, which was slipped from the defenders. Takagi picked it up, ran the channel, and passed it to Mizunuma sprinting from the other side. Mizunuma calmly did the rest. Near the end of game, Kim Jing Hyon saved their attempts superbly. Cerezo won the game with 3-1 against Nagasaki.